Tom the builder is here and has ripped out old kitchen. Paul is acting as his apprentice, and he’s loving it. This is the kitchen we’ve been living with. The hole above the window and the unfinished wall beneath the window have only been there since the new double glazed window was fitted. We had to raise the window to allow for a bench to be fitted underneath. 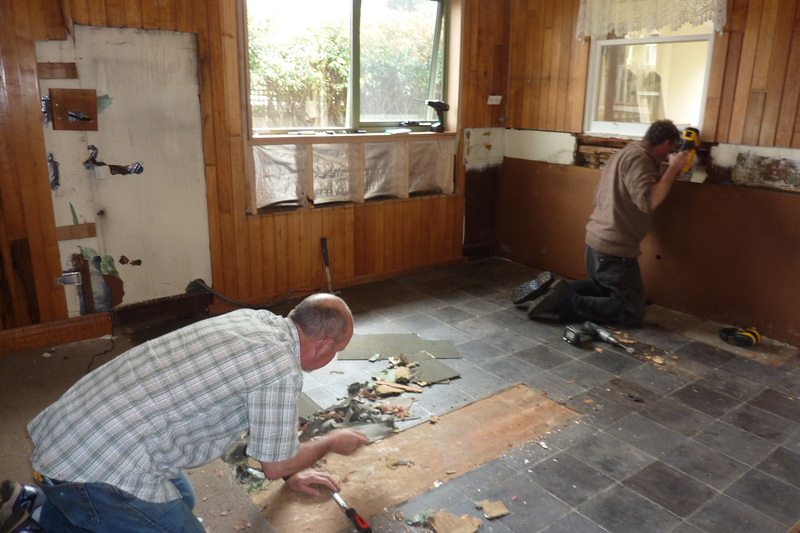 Tom and Paul working in the gutted kitchen. Paul’s chipping away the remnants of some 50’s carpet that had been left in place under the cupboard unit. 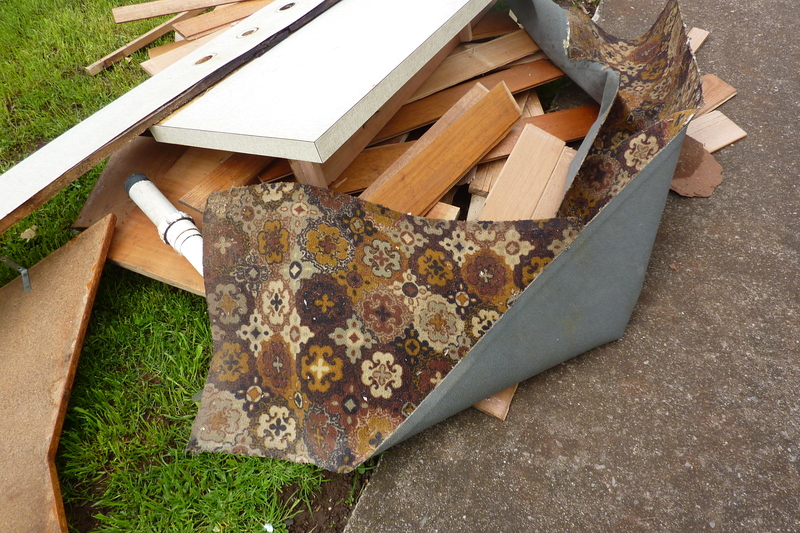 Carpet that the boys found in place under the cupboards. We’re in speed mode now. Paul’s dad is in hospital for the second time this week and isn’t doing so well. We’ve been told medically there’s no urgency, but he’s not able to cope caring for himself at the moment, and it’s doubtful if there’s any chance for improvement. He is being assessed over the next few days. We don’t know what the outcome will be for the short, or long term. We’ll be going back to the UK as soon as we can, to do what we can. Our hope is to assist his dad to live out the remainder of his time in his own home. Until we get there we hope the Social Services will perhaps place him in some interim care. If, however, the time has already arrived for permanent full time care, we’ll need to be over there to organise the sale of his home. We hope that’s a bridge we don’t have to cross.The joys and tribulations of either being an only child, or being married to one. Especially difficult when we live a 30 hour plane trip away. Although we had been expecting this, the suddenness of the situation becoming urgent has us at sixes and sevens trying to get things organised here. We have two choices, the first being to take a short trip to the UK leaving this house vacant. We don’t like that idea for many reasons, not the least of which is, it would prove a costly drain on our finances. The second option, which we’re pulling out all stops to make happen, is to get the house rented out so as to be able to stay for as long as needed in the UK. Tom, the builder fortunately has agreed to help. 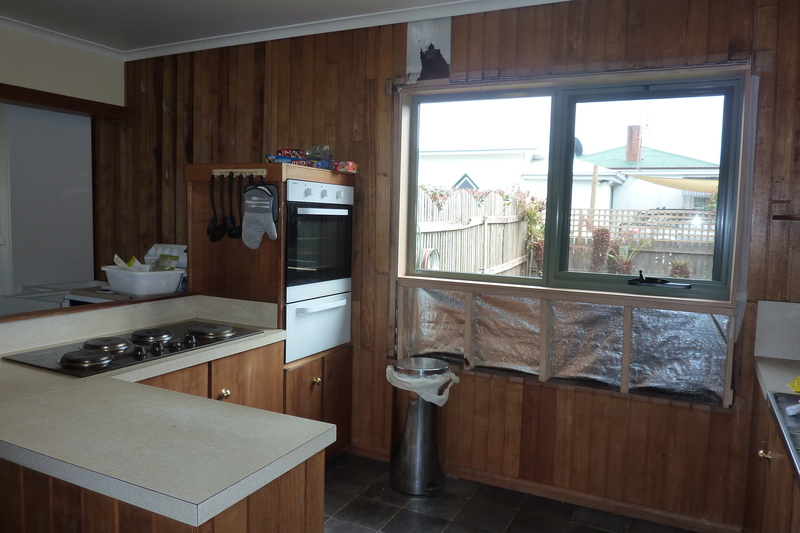 They should get the kitchen finished this week. Then Tom will patch the ceiling in the lounge. It really needs replacing, but we’re going to make do for now. We’ll be using our evenings to paint the walls. After the kitchen is finished Tom is going to help Paul to get an outbuilding re-roofed and weather proofed. We’ll use that to store and secure our belongings. That will probably take another week if we don’t hit any hiccups. Then our laminate floor can be laid. Again, Tom has agreed to help if needed. We’ve put our little car on the market, and later this week after we’ve taken the old kitchen to the tip, we’ll put our little trailer on the market. Hopefully they’ll sell quickly without us having to sell them at too much of a loss. We’ll put the caravan and ute into paid storage, ready for our planned two year trip around Australia. 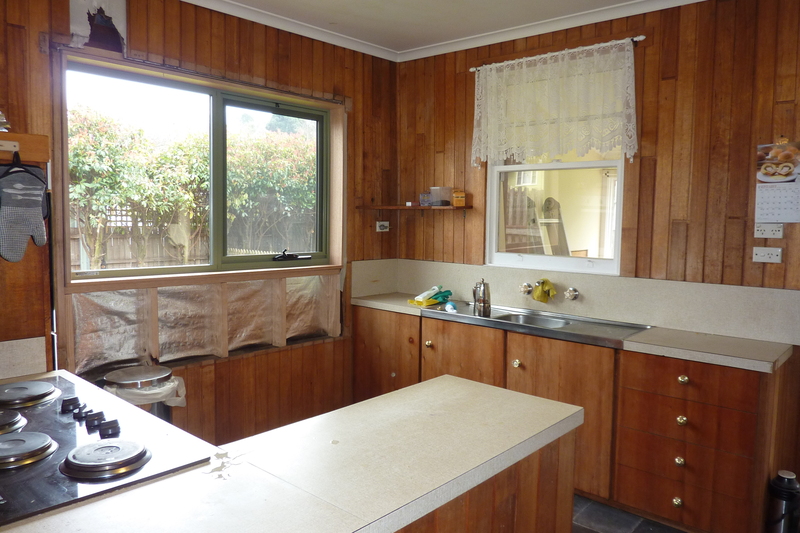 Our original, tentative plan was to get the house ready and rented for the end of next summer, with our belongings secured on the property, and then we were going to set off around Australia for a good two year period. So, plans aren’t deviating to much, just not as relaxed getting to the departure date for Australian trip, and we don’t know when it’ll start. We’re hoping 3 – 5 weeks will see everything finished, and see us on our way. We’re due for some good luck this year, so we’re hoping it arrives now. I hope we’re not hoping against the odds for that 3 – 5 week grace to get ourselves organised.